Im back with another first impression post! There has been a lot of hype about the new Maybelline Fit me foundations, So of course I had to add it to my collection. 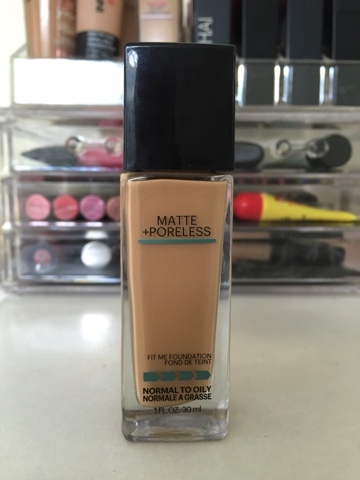 I went to my local Coles when they were having a half price sale and got the Matte + Poreless foundation as I find my skin can get very oily, especially when I don't use matte foundations. the colour I wanted wasn't in stock so I went with Sun Beige. Its definitely too dark I, but I have managed to mix it with some of my lighter foundations so I can wear it. Lets get straight into it! The packaging is very nice, however I do wish it had a pump. The product applies really nicely. Its easy to blend and gives medium to full coverage. I found it didn't try too quickly to give you time properly blend out the foundation. It felt light on the skin and very comfortable. I had been at work all day and checked my face just before I was heading home. I noticed that the foundation had separated on my chin and nose. You could start to see my pores and blemishes. My skin no longer had a matte finish as the shine had come through, especially on the forehead. I left the foundation on for a few more hours once I had been home. It had completely come off my chin, and my whole face felt very oily and looked super shiny. It didn't feel thick or heavy, but it didn't look nice. Even though the matte effect of the foundation didn't last all day, I was still happy with the foundation. I loved the way it applied and made my skin look. I have worn this many times since, and after simply applying powder throughout the day to keep the shine at bay really helps. As the product doesn't state that it lasts for a specific time frame, I can't say this product doesn't do what it states. For a drug store product, I think its definitely a great foundation. If you had normal skin, I think you would really love it! Considering I got it half price, Im not to fussed about the matte effect not lasting all day. As its too dark, I will wait until it is on sale again to get the lighter shade. Whats your favourite matte foundation? Id love to do more first impressions so leave a comment down below!